Coconut cake is one of my favorites on a long list of favorites. I usually like mine very simple, lots of frosting and coconut layered between moist and delicious cake. Sometimes, I get a slice that has a lemon curd filling just to mix things up a bit because lemon and coconut work beautifully together. By now you are probably expecting me to blog about my coconut cake, but that is not happening today. Instead I am talking about lemon coconut bars that even include a thin chocolate layer. Trust me, there really is a connection. Samuel and I were having trouble deciding what I should bake this past weekend. So we started naming ingredients that we like. Lemon, chocolate and coconut were high on my list. Eventually, I knew what I wanted to make even though I had not thought about how to accomplish the end goal. A lemon shortbread base sounded quite nice topped with a layer of chocolate and then finished with sweetened coconut sprinkled over the chocolate. What could be bad? Well, actually, the first time around I did not bake the shortbread long enough and I also decided there wasn’t an intense enough lemon flavor. Additionally, the chocolate layer was too thick and dominated the taste. Not good! Next time around was so much better. Adding lemon zest to the base allowed the lemon to pop. I halved the chocolate amount so that it then complemented the overall flavor and I also added more sweetened coconut on top. Some people may say very nice things about a dessert, but when the bars were disappearing, that was when I knew the combination worked. 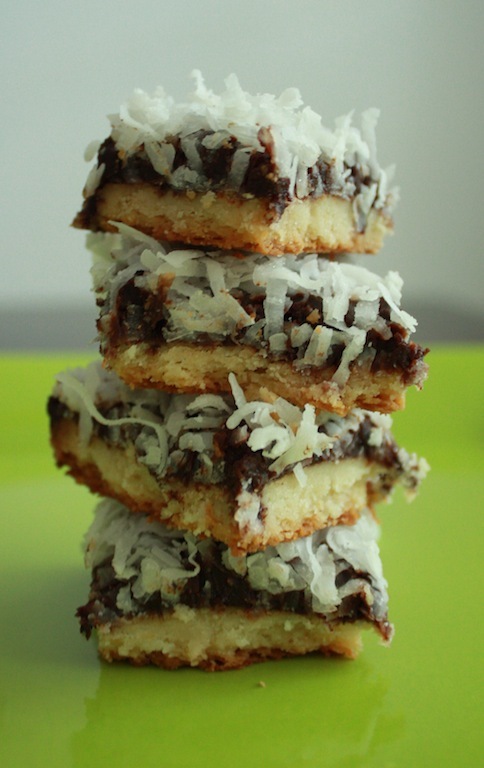 One of these coconut cravings will lead me to my Coconut Cake, but when I want a quick and easy coconut fix, these Lemon Chocolate Coconut Bars will do the trick. Line an 8” x 8” baking pan with aluminum foil and set aside. Preheat the oven to 350°. Place the butter, lemon zest, lemon juice and confectioners sugar into a large mixing bowl. Mix until well blended, scraping the bowl down as needed. Blend in the flour. Pat the crust into the bottom of the prepared pan. It is easiest to use the palm of your hand because the dough is sticky. Prick the crust with a fork. Bake the crust in the center of a 350° oven for 25 minutes rotating the pan front to back halfway through. Check periodically to make sure that the crust does not puff up. If it does, fork it back down. After 15 - 18 minutes of baking, tent with aluminum foil to prevent the crust from getting too dark. In a small saucepan over medium low heat melt the butter with the cream. When it starts to simmer, turn the stove off and add the chocolate chips. Stir until the chips are completely melted. Pour over the cooled crust. Sprinkle the coconut over the chocolate. Pat down lightly. Refrigerate until set, at least one hour. Once the chocolate has set, lift the aluminum foil out of the pan. Peel off the aluminum foil and transfer to a cutting board. Cut into 16 bars using a sharp knife. Serve at room temperature. I love anything with lemon and chocolate. I made these yesterday and they were so yummy. Loved the flavor of the lemon shortbread and you never go wrong with a chocolate top sprinkled (heavily) with coconut! Thank you for letting me know. I completely agree with you regarding the chocolate/coconut combo! I love having bars around because, with teens in the house, they’re so much easier to deal with than a cake. They take the tin of bars and a bunch of napkins down to the basement and I don’t have to worry about plates and forks. This will have to go onto my “to do” list. Great mind think alike…I love the ease of bars, especially with kids! Normally, I write and tell you what my friends have to say after I have served them one of your recipes. I’m going to give a different type of endorsement this time. I made these bars for company and after cutting them and placing them on a beautiful serving platter, I had three left over. I knew that one was going to be for me to eat before everyone arrived. That left two. I ate my one and that made my decision very easy: the other two were mine to eat right then and there, as well, and no one would ever know the difference. Every bite was absolutely delicious. The shortbread just melted in my mouth as did the divine chocolate and coconut. There is no doubt in my mind that my friends will mimic my thoughts. Thanks for an easy and scrumptious treat. Thank you for letting me know. From the sound of it, your company was lucky they received any of the Lemon Chocolate Coconut Bars. You must be a very good sharer!